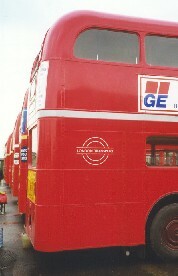 Production of standard length Routemasters may have finished, but the programme of fleet renewal went on as the longer version came on stream. 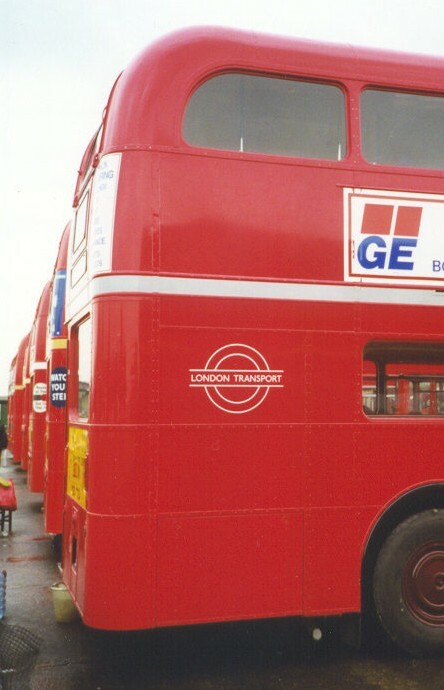 Few Central garages received new RMLs without having RMs first, and in many cases the new buses went onto the prestige routes that had received the RMs earlier. This created a cascade of secondhand RMs to continue the removal of the RTWs into the training fleet (and Ceylon), followed by the RTLs. But the rush towards one-man operation brought the comparative experiments between the new RMLs and the equally new Atlantean XAs and Fleetline XFs. The first route chosen in the Central Area for the XAs was the 24, already RM operated by Chalk Farm. The RMs went to Putney and Riverside to replace RTWs on the 74. Further Atlanteans went to Highgate for the 271, whose RMs went to Chalk Farm for the 45. The longer RMLs displaced RMs from other busy routes too, taking standard RMs to many places in the Central Area throughout 1966 and 1967. Right at the end of the RML programme there were even new buses for Croydon! 1968: The Merlins arrive in force. The shape of things to come was seen in mid 1968 as the Merlin single-deckers arrived in huge numbers. Not for them the long gestation of the Routemaster and a slow introduction into service to iron out the snags. There had been a group of prototypes on the Red Arrow services, but now they were to revolutionise London travel, with feeder routes serving local nodes onto trunk routes. The new schemes chopped across many long-established travel patterns, and RMLs and RMs were displaced by the changes as well as the RT/RTLs. Consequently RMs appeared on new routes and at new garages, while the RTLs disappeared entirely. The problems with the Merlins made 1969 a quiet one for RM redistribution: LT was having problems keeping the Merlins on the road, and lessons were being learned about the attachment people felt for their traditional routes: re-shaping into trunks, nodes and feeders was not being an unqualified success!. 1970: Swiftly into a new decade. The Swifts too made little immediate impact on the Routemasters, their target being the remaining RTs. It was anticipated still that crew operation would have disappeared by the end of 1978, and few anticipated that not only the RMs but some of the RTs would see out these single deckers. Nevertheless there were alterations that affected the RM pattern, such as the success of the Red Arrow network, so still RMs replaced RTs here and there. RMs by now had grey cant-rail bands and block-lettered fleetnames. The trial Atlanteans had not been happy in Central London, and were displaced from Stamford Hill and Tottenham to Croydon for the C network, where they could work in OMO mode. (So TC didn't get to keep its new RMLS very long: secondhand rejects AGAIN!). The XA's duties in town were taken over by RMs displaced by reshaping elsewhere. North-west London reshaping saw some RM routes lost to Swifts, but new RM routes also figured in the plans. There were occasions elswhere when RMs were replaced by RTs during the allocation changes arising from the reshaping plans. 1970 also saw the arrival of the bus that was supposed to be its nemesis: the DMS Londoner (or Daimler Fleetline in a London box). The year started with the first dislodgement of RMs by DMSs, and throughout tyhe year there was a succession of movements as RMs and RMLs were dislodged or replaced by DMS or SMS buses, in turn replacing RTs. A visible change to the RMs themselves was the acquisition (by only 100 RMs) of DMS style open bullseye motifs instead of the block fleetnames that had become standard in 1970. Later in the year all the buses in the fleet that had rear wheel trims had them removed, RMs included. RM349 sports the 1971 style motif in preservation (Showbus 98). Photo by Ian Smith. Click to see it clearly. 1972: Going spare over spares. The OMO tide kept rolling in, with RMs replacing RTs as they in turn were ousted by DMS and SMS. But another problem raised its head in a big way. SPARES. London Transport was suffering terrible problems sourcing spare parts, as manufacturing industry closed or reorganised in the business takeovers of the day. Now the non-standardisation of the RM took its toll, as manufacturers of some of the class equipment disappeared (including AEC). Commissioning of large quantities of spare parts was not too difficult, but replacement of parts in penny numbers was becoming impossible. Many buses were just not leaving the garage, and London Transport's vaunted very high availability figures lay in ruins. Many buses became "Christmas Trees", from which parts were robbed to keep others going. The situation was so bad that RTs were recertificated for further service, and 34 RTs were BOUGHT from London Country! At the end of 1972 the livery band was officially changed from pale grey to white - but the difference between faded grey and grimy white was so slender that it went largely unremarked. 1973-75 Availability gets even worse. During this period the spares situation grew worse. RMs and RTs were kept going, while the rear-engined buses earned a dreadful reputation. Perhaps in a friendlier climate, with spares available, they would have been made to work, like the RMs and even the RTs before them. Both classes had had protracted teething troubles. But by June the first MERLINS were being sold, and replacement double-deckers were being ordered. The single-decker revolution was over in London, for the time being. More DMSs took over RM routes, and their RMs were dispersed to replace RTs that were not re-certifiable. From the beginning of 1975 the fleetnames began to be replaced with a solid white bullseye totem, with fleetnumbers in white too. RM8, still the experimental bus, was the guinea-pig. Internally too there were changes: the ceiling colour of the lower saloon changed to white (although the upstairs remained yellow to hide the nicotine staining). The spares situation became bad enough to require the hiring of buses from other operators. Croydon's RMs shared route 190 with Leyland PD3s from Southend Corporation during 1975 and 1976. The RMAs were also acquired from BEA and used temporarily at Romford on the 175. The bus shortage was partly alleviated by the arrival of the Metro-Scania "Metropolitans: the MD class. These displaced RMs from the 36 group during the first half of 1976, and represented a major step forwards from the DMS class in terms of ride and passenger comfort. Despite excellent acceleration they still proved slower than the RMs, because of their doors. This was to be a significant factor in the retention of RMs as time went on. Further MDs went to New Cross on the 53. The Peckham and New Cross RMs enabled further proper RT route conversions in south-east London. RMs continued to take over on RT routes, even where these had not been officially changed over. In Central London twenty-seven RMs were painted in a silver livery to celebrate the Queen's Silver Jubilee. 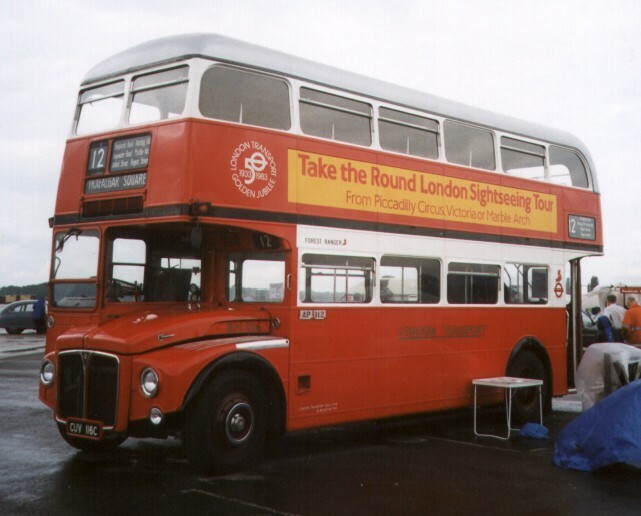 London Transport did not pay for this itself, but collected sponsors for the twenty-five of the buses used in service, which then wore the sponsors's exclusive advertising. (The other two were trial runs: RM2 for LT to test the idea, then RM 442 to show the sponsors). The service buses operated between February and November 1977, when they returned to red livery. The implementation of Busplan78 saw a shakeup of service provision, easing the bus shortage by a reduction in the number of buses required. More RT routes were converted to RM, including the 140 (worked by Harrow Weald, which garage thus received its first RMs since rejecting them at the beginning, 15 years earlier) The surviving RTs concentrated at Bromley and Catford for the 94, and at Barking where a narrow bridge prevented their elimination. But in August the 94 finally went officially to RM operation, as the last of the DMSs went into LT service. Suddenly there was a surplus of RMs, and apart from Barking's few RTs they were the oldest double-deckers. About forty went into store at Clapham, whilst others were distributed around the system to act as spares. But the future for the RM was not all bleak: a report to the GLC in the autumn pointed out the problems with the Daimler fleet and asked to be allowed to dispose of them, and also, significantly, commented on the effects on running time and street congestion when doored buses were used in place of open platform types (ie RMs and RMLs). The conclusion was that the RM fleet should be kept as long as it remained possible to overhaul and maintain them economically, NOT replacing them with two-crew buses. 1979: Reversing the trend: displacing DMs. However, the start of 1979 saw many RMs out of service during the bitter cold, and some with no crews to man them, as London Transport suffered a 13% staff shortage. The last RTs were replaced at Barking, with an appropriate send-off, and the first Fleetlines went for scrap, with few tears. During the year several routes were reconverted to RM operation from Fleetlines. Simultaneously with the Shillibeer buses London Transport introduced the Shoplinker service around the West-End stores. Again sponsorship was sought, but sponsors were found for only about half of the dedicated fleet. These, based at Stockwell, wore a special livery of red and yellow, and were fitted inside with speaker systems to play music and adverts. As expected, they were not a success (their raison d'etre was political not economic), and they were withdrawn at the end of the summer. All were immediately repainted red before resuming normal service, although some wrap-round advertising was retained until the contract expired. RM 2187,  RM 2188,  RM 2189,  RM 2207. A small visual change that appeared on ordinary RMs from December 1979 was a small portent of larger changes to come: the white symbols for each of the eight Operating Districts appeared on the unglazed panel ahead of the platform. London Transport was now taking into service RMLs bought from London Country, as well as the RCLs. The influx of non-standard RM-types into the fleet allowed ordinary RMs to be released from the training fleet for passenger duties. These enabled more Fleetline routes to be taken over. Another significant swap was of RMs for MDs at Peckham for the 36 group. The MDs, while well-liked, were corrosion-prone, and were to be replaced. The 36 group had been identified as a good case for applying the BUSCO system of vhf radio for route management, The RMs were considered a better long-term bet than the MDs! The MDs went to Plumstead in exchange for RMs for Peckham. On the other side of the coin, the RMs on the 62, so recently the final haunt of RTs, were now displaced by the first Leyland Titans. The first MCW Metrobuses also went into service in north London, displacing RMs. Appearance-wise, 1980 saw the start of the showbus phenomenon, in which garages were encouraged to keep a "pet" bus - still in service but maintained in show condition. This was often an RM, so examples began to appear on which the outward changes of the years had been reversed, some of them taking on an "as-new" appearance. LT flirted again with the idea of saving money at repainting time by eliminating the cantrail band, but after a brief trial in North London decided that it was not a good idea (again). A major public event in 1981 was the Royal Wedding of Charles and Diana (to escape from which I fled into France, where it was viewed by the locals with some amusement.) Once again a sponsorship deal was proposed. RM 490 was repainted as a trial into overall red with a silver ribbon and "greetings" card. This "Parcel "livery attracted just eight sponsors, and a batch of overhauled early RMs appeared in June. They worked ordinary services until the day before The Event, when they worked a special service along the "wedding route" during the day, and the Royal Fireworks in Hyde Park during the evening. They were NOT used as wedding vehicles. Nor did they have a honeymoon. They returned to mundane services until repainted in the autumn. Meanwhile, the GLC's Fares Fair policy, with subsidised low fares, produced a boom in bus (and tube) ridership, a reduction in car use, and faster journeys for everyone. A programme was begun of re-equipping the early RMs that had non-standard equipment, to ease the long-term spares problem. BUT...The London Borough of Bromley, which was of a different political persusion from the GLC, was served by no London Transport railways, and felt agrieved at the Fares Fair policy. It took the GLC to court. It finally won in the House of Lords in December 1981. Everyone else lost. Fares had to be raised dramatically, bus ridership plummetted, congestion increased, journey-times extended again, and there were surplus buses again. Recognition of the effect of lower fares gave rise to legislation that allowed the introduction of the successful Travelcard (which didn't offend Bromley as they included train travel in Greater London). By the end of 1982 there were 98 RMs being scrapped at Aldenham, and another 60 were on sale..
1983 and early 1984 saw continued attrition as more Metrobuses and Titans, as well as Leyland Nationals, saw off the Fleetlines and some RMs. 1983 was a golden Jubilee for London Transport, and it celebrated with special liveries and Open Days. Some buses, including four showbus RMs, received versions of the 1933 livery, of red with white window surrounds, black lining and a silver roof. Each was slightly different in application, particularly around the cab. (They were RM8 (SP), RM17 (AC), RM1933 (CF), and RM2116 (AP)). Other showbuses sported gold bands. LT did not leave it all to local initiative, however, and repainted RM 1983 (what else!) in overall gold without adverts. (Titan T747 was also painted gold; Metrobus M57 and Titan T66 received "1933" livery.) Special Golden Jubilee logos were applied to all the special buses. All this local enthusiasm for old buses must have shocked someone with a puritanical streak, for early in 1984 the decree went out that all the showbuses were to be repainted in standard livery. This resulted in the sale of many of the showbuses to the staff who had devoted so much time and effort into looking after them. 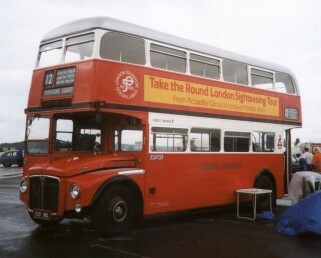 RM2116 was the showbus in 1933 livery that escaped the repaint order, by being delicensed in May 1984 and then sold into enthusiastic preservation. Named "Forest Ranger" during 1983, RM2116 still bears the name today. This view is at the 1998 North Weald Rally.